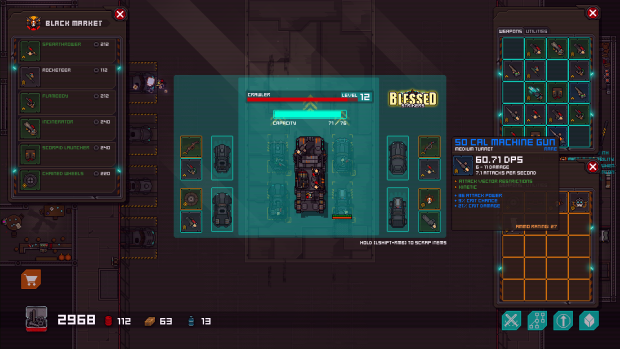 Blasted Road Terror is real-time tactical looter in post apocalyptic setting. Command mighty warcrawler and manage squadron of vehicles in order to get unseen riches of the world and reach immortal glory. You will collect mighty arctifacts during your journey, enlarge your vehicle squadron so you can always pick right one for the job, rebuild your home base, make new friends and discover terrible enemies. Hello Everyone! Blasted Road Terror reached great milestone, the start of Early Access phase! After year and half long development it was about time for BRT to leave my living room and present it self to the public. I wish the release was more glorious, packed with many more features and content, however thats what early access games are, probe in to the minds of players to help pick the right direction, learn whats important and whats not, investigate what audience likes most about your game and expand it. The game still have about 6 months of development time ahead it self, no matter what. In following half of the year i would like to double the ammount of almost everything whats in the game currently. Be it vehicles, items, enemy types or mission types and some additional content as well. Blasted Road Terror is meant to be tacitcal looter inspired by Mad Max movies and some of my favourite games. Game currently offers about 10 hours of gameplay till you explore all of its secrets. Currently game lacks heavily in sound department and some of the ingame graphics(especialy UI) is still not final. However game is perfectly playable as it is, you can run missions, patrols(dungeon like adventures), upgrade your base, level up vehicles, upgrade your Main Command Vehicle(MCV) through its talent tree, and most importantly loot and equip items. Unfortunately not everything is as polised as i would love to and dont expect too much, game just entered beta stage and there is a lot of weekspots that ll be improved one after another. Instead treat purchase of BRT like gesture of support of the project. After day one patch i started works on first bigger update, it ll bring two new vehicles, new mission type, ghoul hunters faction items shop and most importantly will fix most of the issues players reported since day 1. Its not that big, but i decided to supply updates in smaller batches once every two weeks instead of letting people wait for months till somethink happen. My plan is to release two smaller updates each time and then close the circle with bigger third one and add +0.1 to the game version number and reach v. 1.0 in 5 "circles" in total. Thats quite few updates(15) you might think? Yes, there is still a lot to do on this game and i still got a lot of ideas and plans for it, including post launch support and additions. But well, im not going to lie, everything pos-launch will depend on how well the game will be received(looking good so far considering big "DO NOT BUY YET" stamp on the shop page). Second update(ETA 3 weeks from now) will bring in new items and weapons greatly enhancing number of possible combinations. And third update will focus on map variety and environments including the players base. Thats it for now and I would like to thank you for your interest and support. Blasted Road Terror is getting really near its Early Access release, click and check whats new! New update, new location, new enemies and tons of improvements. Last alpha release before game hits bitea stage and steam early access! Third update is finaly here, opening Highland location, new set of enemies and in addition it comes with package of other improvements. Blasted Road Terror finaly entered Alpha stage and "Dust Storm" update is aviable for everyone. This update brings in Tundra teritory, Purifiers enemy faction and tons of tweaks, improvements and fixes. Highland location is finaly open for exploration! In addition tinkerer appeared in base and tons of improvements were implemented. Enjoy! This update brings in new vehicles, new weapon, ghoul swarm event and bit of eye candy in form of weather system. Blasted Road Terror open alpha concept test. For more info visit the game profile and read latest article. Thank you! Hi. I discover your game with a lot of pleasure but controls are nightmare on AZERTY keyboards (for steerings and camera control). Do you plan to let us set custom controls soon ? Hi i've get an issue, in patrol, i have forgotten to click to change road, and my cars have continued to run, but with no enemies, i had to restart the mission to be unbocked. Thanks for report! Will definetly look in to it what might have happened. If you ll have some free time, could you try to replicate the error and let me know what exactly happened? Thanks in advance! hey dev question here. I have unlocked the Unagan missiles. Can you tell me how it works? like what keys do i have to press to fire. Uragan missile launcher fires automaticaly if something gets in front of it and it is within range. Its great weapon for boss fights or ghoul ambushes and for upcoming "intercept" missions. Keep it up devs! You are doing one of the best games i ever seen! It's just nice to look at the art style and you are offering us a depth experience in a very simple and enjoyable experience. Thank you !!!!! Is there any way to change controls in 0.22? How would you want to change point and click?? Or are you suggesting main vehicle steering? (probably couse of azerty keyboards?) If you have any suggestion, let me know. And no, there is not. Thanks for the quick response, the main vehicle steering is no problem since a have a qwerty keyboard, i meant change the controls in general such as changing the buttons for selecting smaller vehicles to any other buttons or switching from point and click to keyborad only controls or even fully customizable controls , since my right mouse button does not work i have to let anything to luck while in a mission be cause i cant control any of the small vehicles to take out any enemy threats. No problem, well sorry about that, but rmb not working is serious problem, i ll include middle mouse button to function same as rmb in next release next weekend just for you untill you ll get new mouse, or i ll introduce customizable controls. Have a nice day! Thank you! And great success for you in the future!